3P Technik Filtersysteme GmbH - Why should we deal consciously with rainwater? 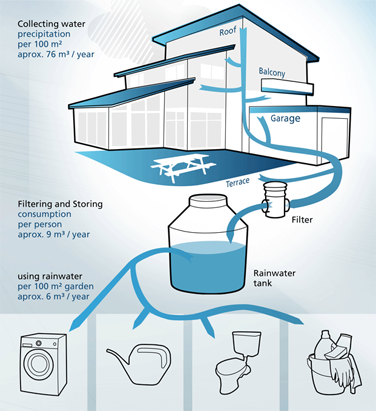 Home > Why should we deal consciously with rainwater? If we save drinking water, we will conserve valuable resources! We should not give away water that simply falls from the sky! Let us deal ecology-minded with the element water! Rainwater is soft water! We therefore save washing powder, we conserve the washing machine and our environment. Our garden will reward us because the plants love such natural water. Rainwater harvesting does save our money, as we do have to pay less fees for water and waste water. Rainwater harvesting serves the general public, as the sewage plants and canalisation are released by the retention effect of the cisterns!